Louis Paul Jonas (1894-1971) studied art in Hungary as a young man. At the age of fourteen he emigrated to the United States and became an apprentice to his brother who was a taxidermist in Denver, Colorado. This early work as a taxidermist taught him a great deal about animal anatomy. 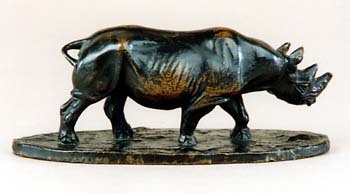 His desire to become a sculptor was so strong that he moved to New York City and enrolled in the New York Academy of Design studying under the famous sculptor Herman Atkins MacNeil. He developed a strong friendship with MacNeil and later during the 1920's worked for MacNeil and Carl Akeley as a taxidermist at the American Museum of Natural History. Jonas' first public commission was awarded in 1930. His bronze monument of a giant Grizzly protecting her cubs titled Grizzly's Last Stand can be found in Denver's City Park. 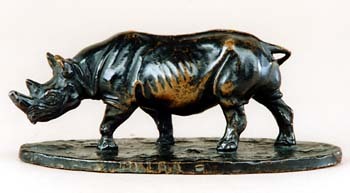 Although Louis Jonas was not a prolific sculptor and very few of his works were ever cast in bronze because of the enormous cost of casting, his few sculptures in terra cotta and other mediums are prized for their accuracy and realistic form.